We’re delighted to welcoming Pinkshinyultrablast back – for their first Manchester show in three years! 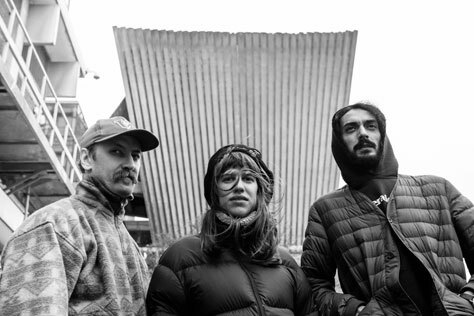 Pinkshinyultrablast, Russia’s finest export, have shared their new single In The Hanging Gardens, soon to available on limited edition 10-inch. The band have also announced an extensive UK tour as well their eagerly anticipated third album Miserable Miracles, due for release on 4 May via Club AC30 (UK) and Shelflife (USA). With vocalist Lyubov recently moving to LA, the band have been exploring new ways of composing and collaborating. Partnered with a line-up refinement, the new material sees Pinkshinyultrablast go down a more electronic path while experimenting with new sounds and genres (including inspiration from Japanese pop such as Chiemi Manabe and Yellow Magic Orchestra). Originally hailing from a city more synonymous with the State Conservatory than a gang of shoegaze addicts, the band have nevertheless seen great critical and commercial success since their debut album Everything Else Matters and follow-up Grandfeathered. They’ve been compared to bands such as Lush but this is no mere throwback tribute – due to their sharp, icy electronics and ability to subvert the genre, bringing something new to the table. They possess not only the spirit of late 80s/early 90s British bands like Cocteau Twins, but also machine-made sounds of the same era from Sabres Of Paradise or Global Communication, not to mention wider vibrations like Cluster, Popul Vuh, Terry Riley and Philip Glass. On In The Hanging Gardens delicate vocals soar effortlessly above a haunting ambience and ethereal embellishments are complimented by a driven beat. It’s the perfect track to showcase the band’s new, more electronic direction and while retaining their signature quirkiness, there’s another layer of experimentation here. Pinkshinyultrablast are Lyubov (vocals), Rustam (synths and electronics) and Roman (guitars). Special guests are Warm Digits. Warm Digits – aka Newcastle-based Andrew Hodson and Steve Jefferis – released their third album Wireless World, and first for Memphis Industries, in August 2017. They are the duo that, in the words of legendary DJ/producer Andrew Weatherall, create ‘machine funk kraut-a-delia – it’s rather lovely!’ Warm Digits’ brew of live drums, guitar and electronics betray a love of Neu!, Kraftwerk, Giorgio Moroder, My Bloody Valentine and Boards Of Canada. Motorik percussion, electronic basslines, Keith Levene-style guitar chops and squelchy analogue warmth are accompanied by live visuals in performances that have graced the psych fests of both London and Liverpool, seen them support the likes of Goblin, Modeselektor, ESG, St Etienne, Moon Duo and many more, toured the UK with British Sea Power and blown the audience away at Supersonic and many other festivals. Their blistering live sets of ‘krautophonic blizzard-wave’ have become have to be seen to be believed. This standing show is a co-promotion with Manchester Psych Fest and Band on the Wall. This is a 14+ show. Under 16s must be accompanied by an adult.